Yesterday I posted a recipe using this wonderful tropical fruit in a delicious pie. Today I will give you the recipe for a Mamey Tea Bread. I love a little something sweet with my coffee or tea in the morning and this is the prefect compliment. 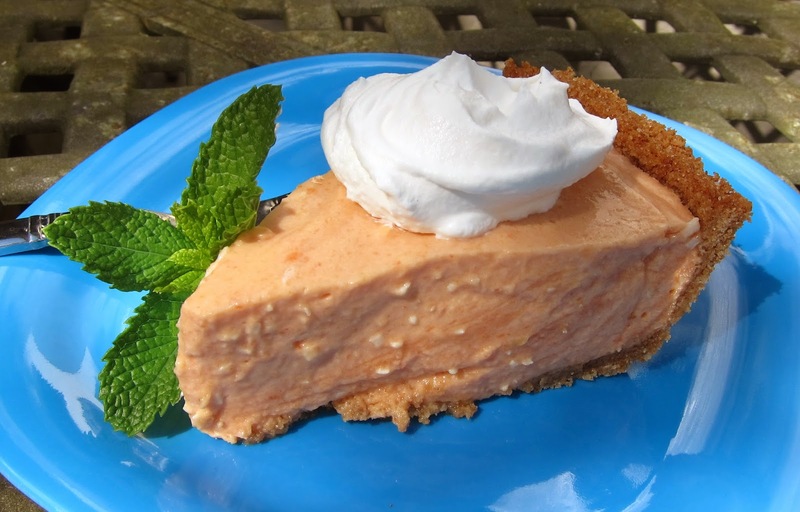 Mamey is so sweet that I was able to reduce the sugar in the recipe it came out just right. Keep watching because I am still eyeballing the pumpkin roll made with Mamey idea I mentioned yesterday. My family and friends just love that roll and so I think I will make it this weekend and pump it up with some pineapple tidbits... Funny story - I brought the pumpkin roll to a potluck once and early on a woman came up to me and asked if she could take whatever was leftover home. Hmmm. Sure I said. Well quite frankly there was not a crumb left! I have a funny feeling if I make it with the Mamey I might have to make 2...or 3! 1. Preheat oven to 350. Sift together dry ingredients. 2. Combine Mamey, milk, eggs and oil and mix well. 3. Add dry ingredients to Mamey mixture and combine. Stir in nuts. 4. Pour into a well greased and floured bread pan and bake for 50-55 minutes. Being a "foodie" I am always game to try new things. When I go to ethnic markets I will browse all the aisles and look for new and interesting ingredients to cook with. Sometimes that works out and sometimes not... Fruits and vegetables are always fun to bring home to try. This fruit is ripe. You can see that it is soft and a bit wrinkled and flat on top where it was sitting on the counter. Here is the inside of the ripe Mamey. It is bright orange and very sweet. This past week I was given the opportunity to try a wonderful fruit! J&C Tropicals sent me a box containing Mamey. Quite frankly when you look at this fruit you would probably not think that inside the rough exterior is this really phenomenal rich, sweet orange fruit. In order to get more insight on this fruit the first thing I did was call my very good friend who owns a Cuban restaurant. I asked her if she eats Mamey. Apparently I was pronouncing it wrong because she said what? I finally showed her what I was talking about and she said ah, Mah-May. Not May-May. So that is how you pronounce it. She told me her family loves it in smoothies. 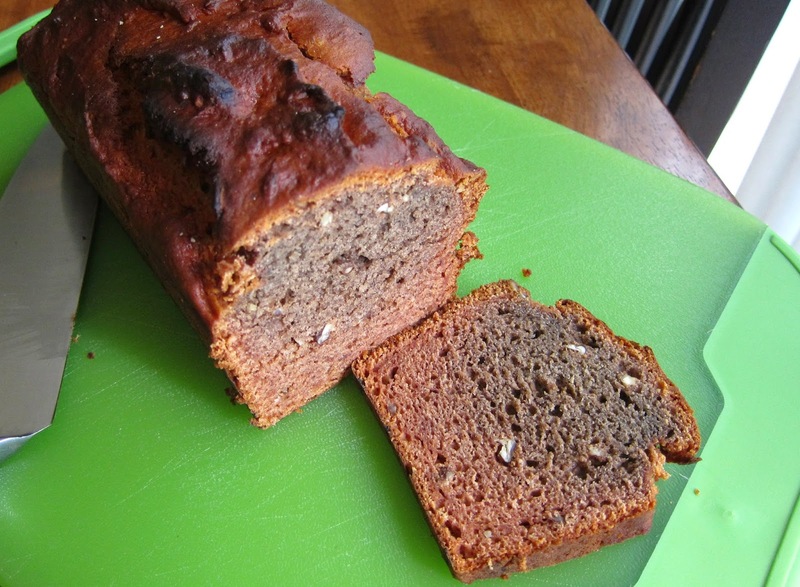 My next post will be the Mamey Tea Bread I made. It came out so good. Perfect with a morning cup of café con leche. Finally, I went on Pinterest and searched for Mamey. While most of those posts were in Spanish I recognized one. It was for the classic Libby's pumpkin roll only made with Mamey instead. MMMM. Indeed now that I have tried Mamey I am inclined to use it in all my pumpkin recipes instead of pumpkin. It is richer and has so much more depth of flavor. It is in season during the summer months so look for it in the specialty produce aisles and give it a try. I have spotted it recently at my produce market. I also read that the puree is sold frozen in Hispanic markets so I will be on the lookout for that during the holidays for my pumpkin roll and pumpkin pie. By the way, the fruit is ripe when it becomes very soft and a little wrinkly. When you bring it home from the market let it sit on the counter until it is soft and the side sitting on the counter is flat. Okay, now on to the recipe. 1. Heat the pineapple juice to a simmer. Remove from heat and stir in the gelatin. Stir until the gelatin is thoroughly dissolved. Set aside to cool. 2. Beat the pudding mix with the milk until starting to thicken. Mix in the Mamey puree and the pineapple juice. Blend thoroughly. 3. Fold in 1/2 of the container of cool whip until blended. Pour into the pie crust. Cover and refrigerate at least four hours. 4. Serve topped with remaining cool whip. This is one of my favorite salads! It is just so good. I can live on this. Just give it to me for lunch and dinner and I am good to go. By the way, I make it with bulgur wheat but you can also use quinoa. I used quinoa when my friend visited. She has celiac thus is gluten intolerant and the salad tasted great. So good in fact that she ate it for breakfast, lunch and dinner! 1. Put the bulgur and the 1/4 teaspoon salt in a large bowl. Pour 1/4 cup boiling water over top and set aside. Put the chickpeas in a colander and rinse well and set aside to drain. 2. Rinse kale well and remove tough stems. Spin in a salad spinner to dry well. 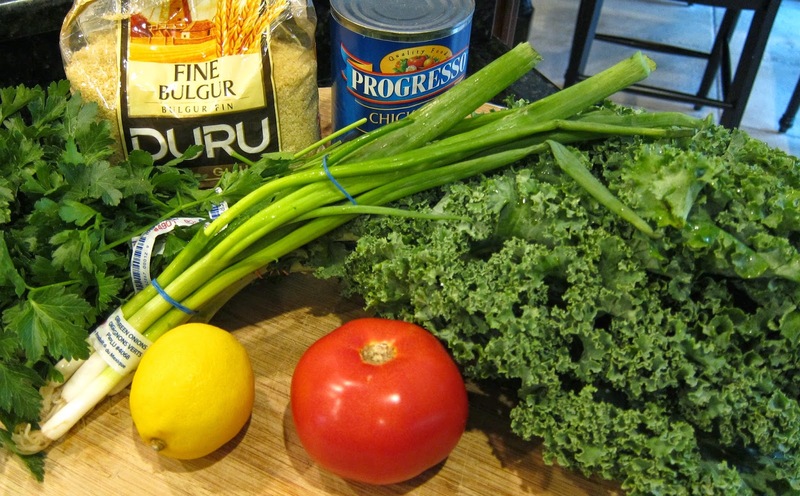 Grab a handful of kale at a time and finely chiffonade it. Add it to the bowl with the bulgur. 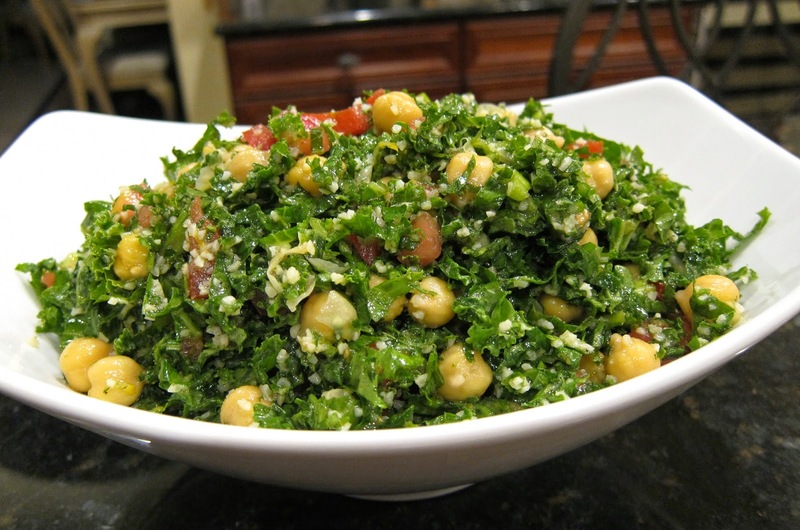 Add the chopped parsley, green onions, mint, garlic, tomato and chickpeas. Stir and mix well pulling the bulgur from the bottom of the bowl. 3. Make the dressing. In a small bowl whisk together the lemon rind, lemon juice, olive oil, cumin, pepper and garlic salt. Pour over salad and mix well. Refrigerate several hours or overnight until ready to serve. A couple of weeks ago I had the privilege of attending the final day of the Southeast Produce Council's Southern Exposure Conference. About 200 companies set up exhibits of their products. This means row upon row of the finest fruits and vegetables you have ever seen. It really is amazing. Yesterday I got a wonderful surprise in the mail from one of the representatives I met. 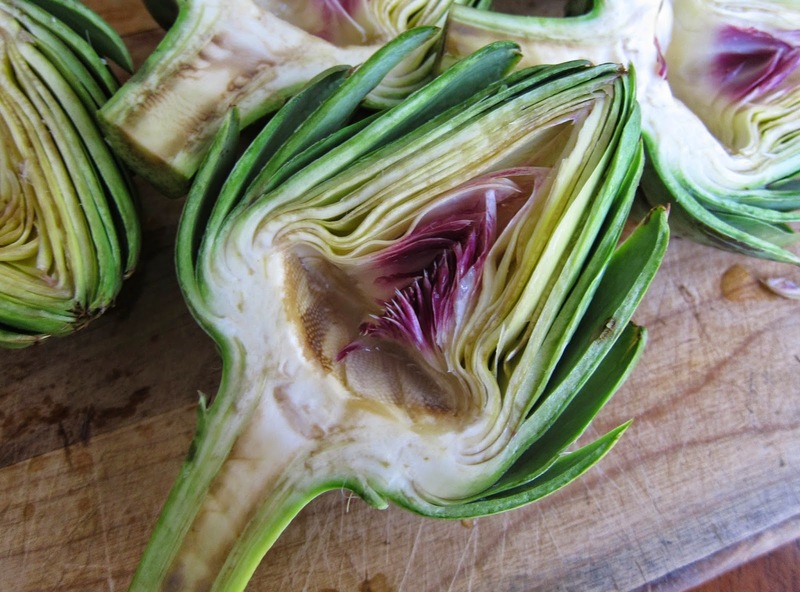 A case of their wonderful Heirloom Artichokes direct from Castroville, CA. 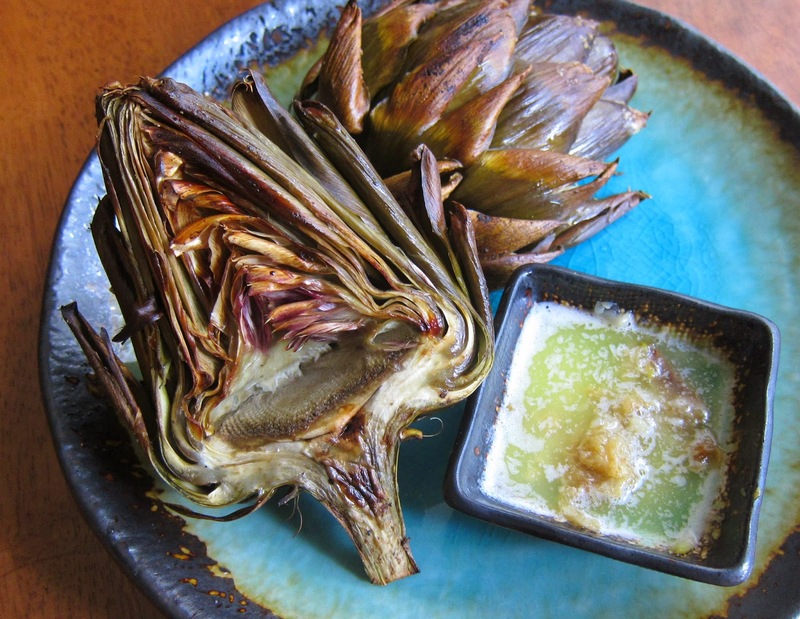 I plan to try several different preparations and began today with these Roasted Artichokes with Roasted Garlic Butter. The roasting caramelized the artichokes giving them a deep rich flavor. I served them as an appetizer. Remove the choke. It is not hard! Put garlic where the choke used to be. It will roast right along with the artichoke. 1. Trim about 1/2 inch off the stem end of the artichoke. Place it stem side up on the cutting board and cut it in half. Immediately brush the cut side with lemon juice using a pastry brush. 2. Use a pairing knife to cut right under the fuzzy choke then scoop it out with a spoon. Brush again with lemon juice. 3. 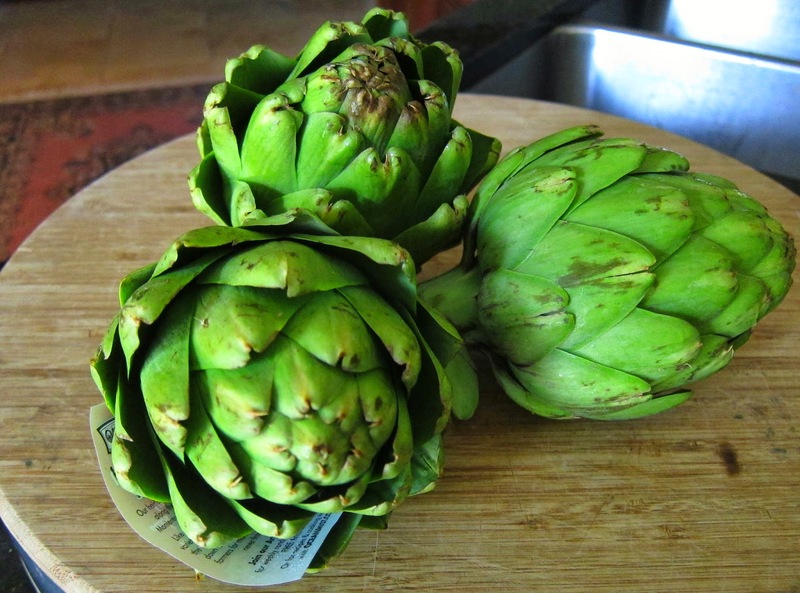 Brush the artichokes all over with olive oil and season with salt. Place a garlic clove in the cavity where the choke was. 4. Making sure the garlic stays in place put the artichokes cut side down on a parchment lined baking sheet. Roast for 15 minutes. 5. Turn the artichokes cut side up, keeping the garlic in place and roast for another 15 minutes. 6. Turn them a final time and continue roasting until done. Another 10 minutes or so. To serve, melt the butter. Have each person mash their garlic clove in their butter dish and then divide the butter evenly among the dishes. Season with additional salt and pepper if desired. Happy New Year! Welcome to the year of the goat and sheep. Indeed today only marks the first day of the Chinese New Year. The celebration lasts for 15 days and each day has a special meaning. It all culminates with the Lantern Festival on the 15th day. That makes for one long party! There is some seriously good eating going on too. Yum! Of utmost importance is eating noodles. They represent longevity. So here is a really delicious way to enjoy some noodles. My kids love these, they will eat them for breakfast, lunch and dinner. 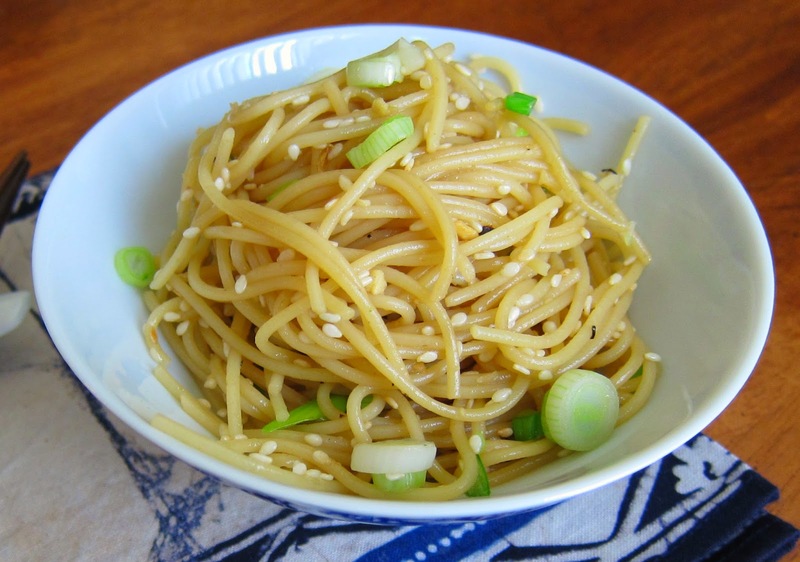 Noodles are meant to be a side dish and as such, this recipe will make 6 generous servings but my kids will eat them as the main event any chance they can. These noodles complement so many main dishes - BBQ and grilled meats, roasted meats. They are so simple to make, so enjoy. 1. Cook pasta according to package. I don't add salt to the water because the seasoning ingredients have plenty. Drain when done. 2. While the pasta cooks, toast the sesame seeds in a small skillet over medium low heat. Stir frequently and watch carefully. This will take about 3-4 minutes. Remove from heat just as they are taking on color. 3. Thinly slice the scallions and mince the ginger. 4. Put the oyster sauce, soy sauce and sesame oil in a large skillet. 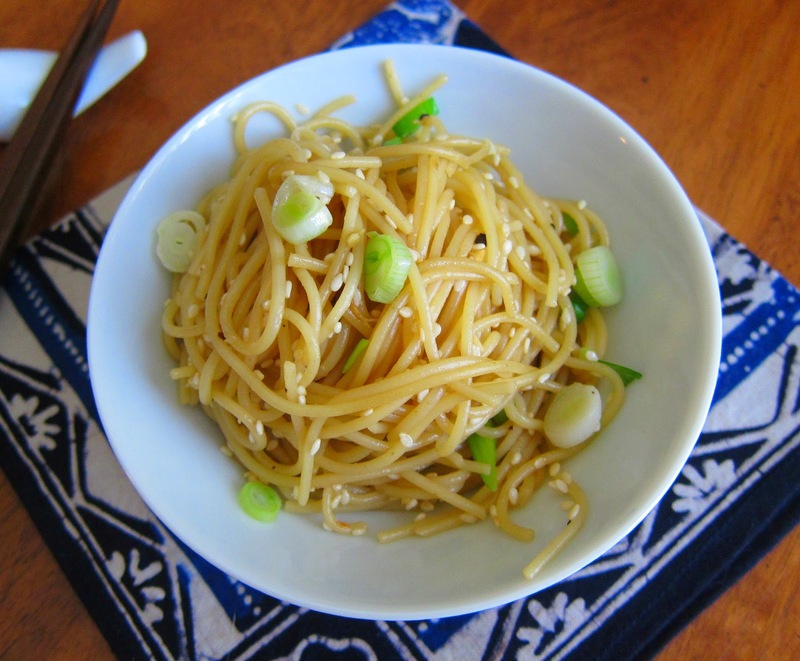 Add drained pasta, sesame seeds, ginger and scallions. Toss over low heat to just heat through and combine all ingredients. I like to use 2 forks for this to get the scallions and sesame seeds all mixed in. Season to taste with pepper. I am not a frivolous person. I am frugal, practical, efficient but not frivolous. I despise wastefulness. At this stage of my life I have pretty much everything I need. When Christmas rolls around I am sure to tell my husband and kids I do not need anything and please do not go buy stuff just so there is something under the tree for me. Really. That is what will make me happiest. And that is just what I said to them back in November. Until one day this little catalog came in the mail from Pier One Imports. Oh - I also do not bake much. I am not good at it. I drool over dessert and baking blogs but I leave it to them. My cakes never look like theirs. Nor my cookies, or cake pops, or cupcakes. Luckily I have kids so I let them do the decorating and then it is okay that it does not look like theirs. So back to that little catalog that arrived in the mail. 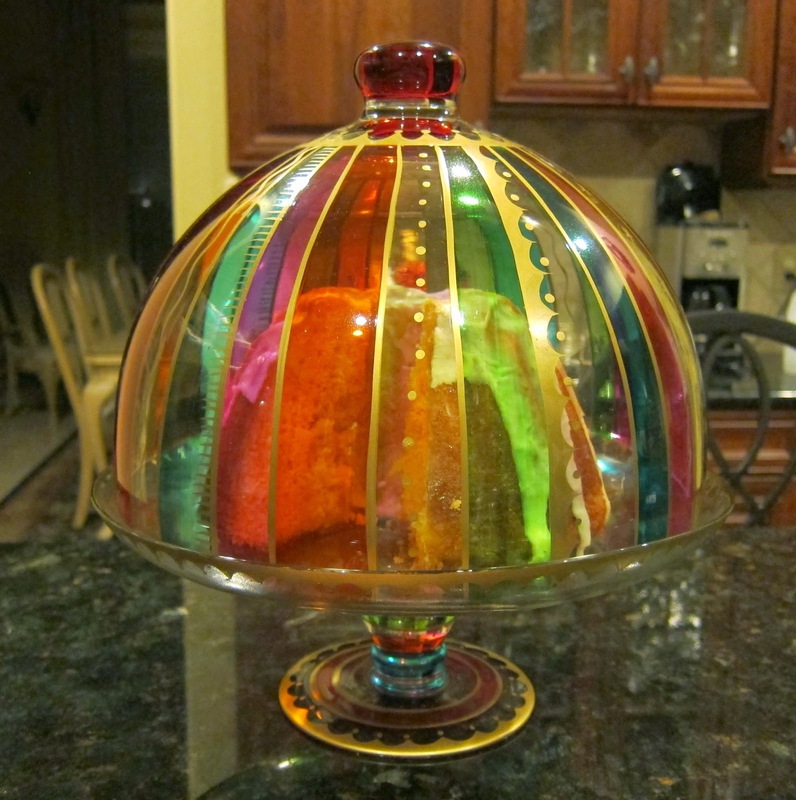 In it was this beautiful cake stand. For some reason I wanted it. And I did not stop wanting it. Usually I can talk myself out of pretty much any purchase. But not this. It is definitely not practical. It is totally frivolous. Really not me at all. But I wanted it all the same and made sure everyone knew it. So here it is. I found it under the Christmas tree. I promised that from now on I will put all the birthday cakes in it. But I did want to try it out. So today I made a cake. I wanted something light and refreshing. Something that would make the stand the star. I had just purchased a box of clementines and they turned out to be perfect. I pieced together this recipe and for once it came out exactly as I wanted it to. It is perfect with a cup of hot tea. Preheat oven to 350. One eight cup cake pan or bundt pan well greased and floured. 1. Remove the zest from the clementines. I found this easiest to do with a carrot peeler. Place the fruit and the zest in a food processor or blender and puree. Strain 1/3 cup of the juice and set aside for syrup and glaze. You should have about one cup puree remaining. Do not strain remaining puree - leave in the pureed fruit and zest. 3. Using a hand blender blend the eggs and sugar together until the eggs are light and the sugar is dissolved. Blend in the oil and the 1 cup of puree. Blend in the flour mixture. 4. Pour into cake pan and bake 50 - 55 minutes until a tester comes out clean. Turn the oven off. Remove from the oven and poke holes all over the cake with a skewer. Pour the syrup slowly over the cake. Put the cake back in the oven for 5 minutes. 5. Remove the cake from the oven and let stand 5 minutes more. Then gently loosen the cake and turn it onto a plate. Melt the apricot jam and lightly brush a thin layer all over the cake. Let the cake cool completely. 6. When the cake is cool make the glaze and drizzle it over the cake. 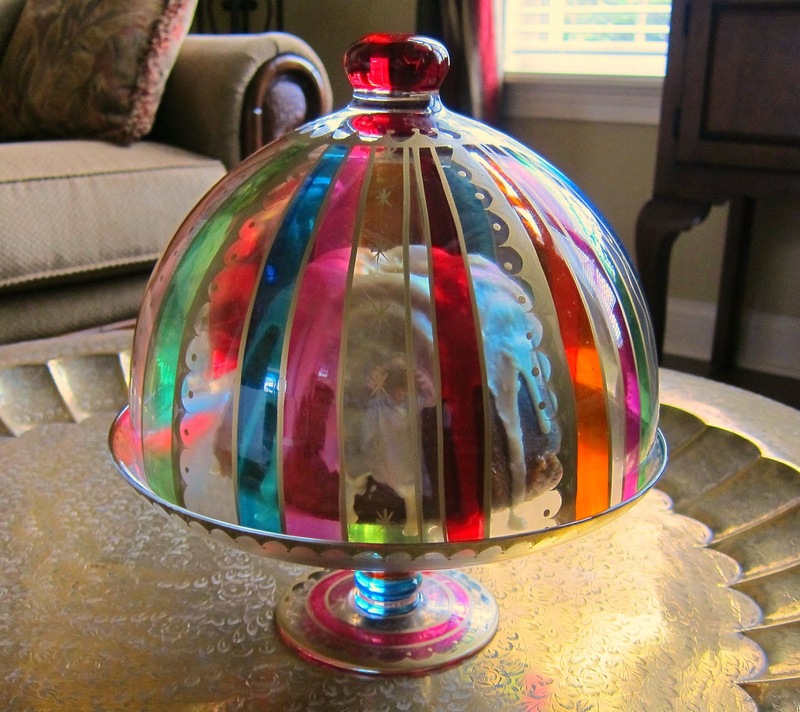 Place the cake on a beautiful cake stand and enjoy! 1. 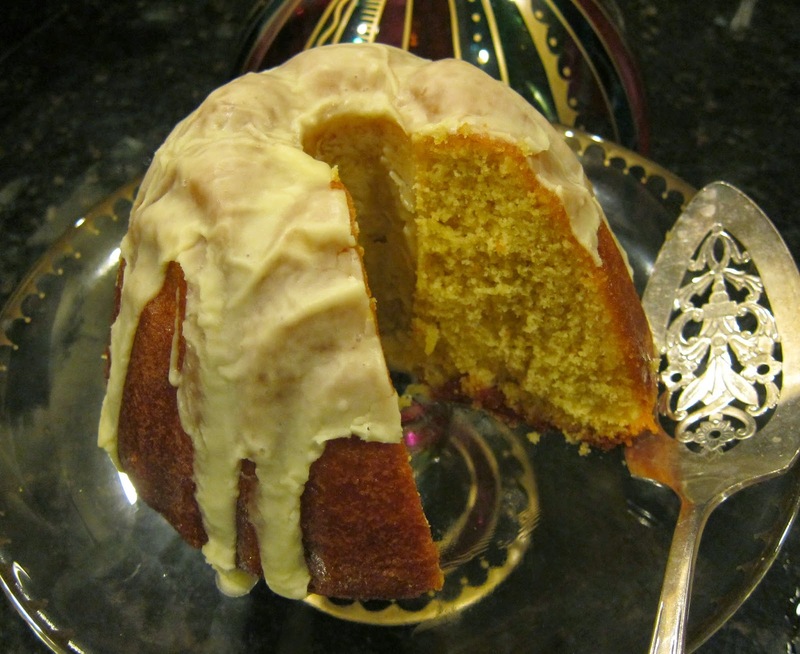 Remove 1 tablespoon of the clementine juice and set aside for glaze. Put the rest in a small pan. Add the sugar and bring the a simmer. Stir and cook until the sugar is dissolved completely. 1 Melt the butter in a bowl in the microwave. Add juice and sugar. Whisk until smooth. Drizzle over cake. This glaze sets up pretty quickly so make it right before you will be using it. I am sad to say my leg of lamb is almost gone. 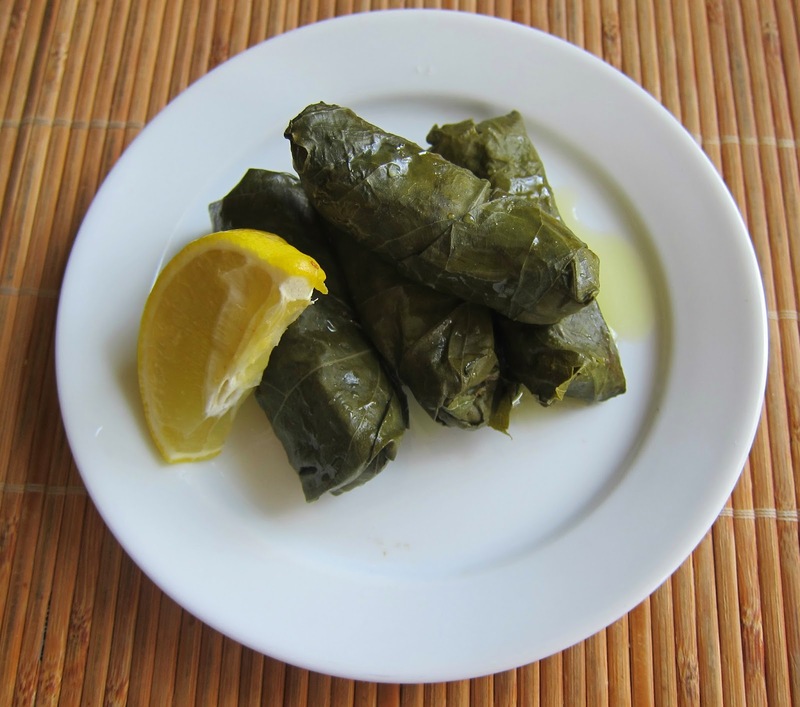 It has made such delicious meals and snacks, from the roast which we enjoyed for dinner, then as lamb sandwiches to the dolmades which we had for snacks and lunches to this final post: Gyros. 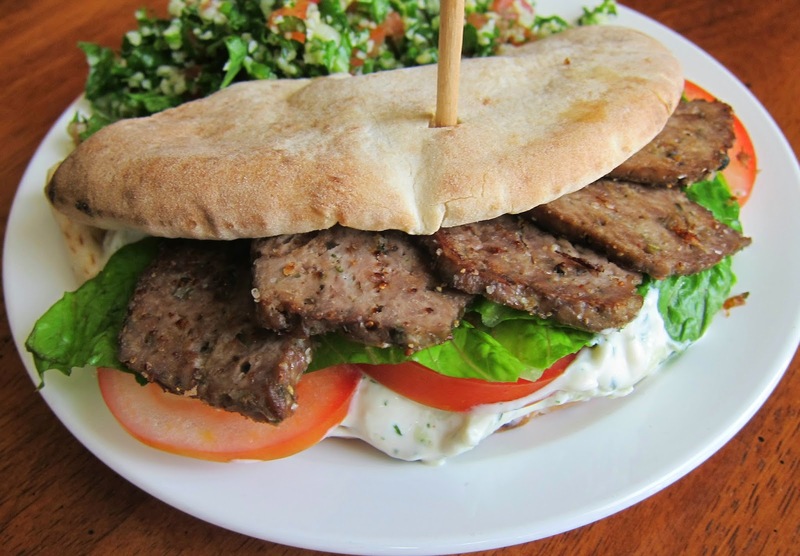 Gyros are a family favorite and they really are not hard to make at home. We enjoyed them in the traditional way stuffed inside pita bread with tzatziki sauce, tomatoes, lettuce and red onion but if you are watching your carbs you can turn this into a fantastic salad. Just make a Greek salad with all the fixings - lettuce, tomato, olives, cucumber, feta cheese - and top it with the heated gyro meat. 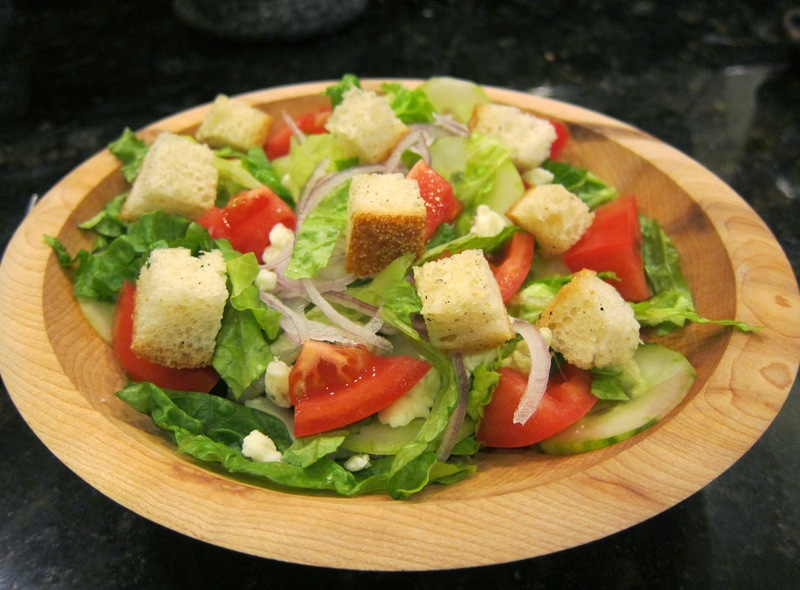 Serve it with Greek salad dressing and tzatziki sauce. How good does that sound? By the way, I use full fat Greek yogurt for the tzatziki sauce. It is so rich and creamy. You know when you eat at a Greek restaurant how rich and smooth the tzatziki sauce is? Well that is why. No fat free versions here. And you are not using anymore here than that huge dollop of sour cream you put on your baked potato. In addition, the yogurt contains those good for you probiotics people pay extra money for at the drug store. This is a much yummier way to get them! If you do choose fat free yogurt (which will still be good) make sure it is Greek yogurt. Any other kind will just be watery. No exceptions - it must be Greek. 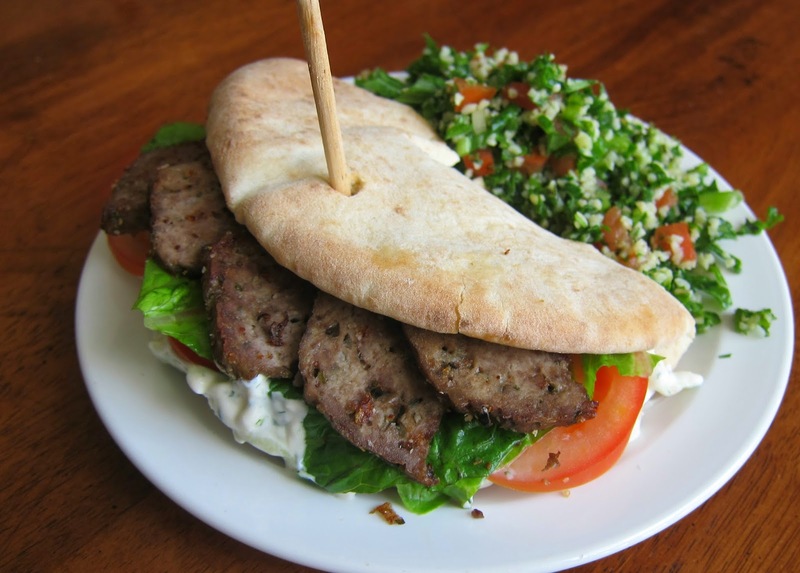 This recipe makes enough gyro meat to stuff 6 pita breads. Prepare the meat a day in advance as it needs to chill overnight. Pack the meat mixture into a loaf pan lined with foil. Leave enough foil over hanging to cover meat later. Slice the chilled meat fairly thin. Brown the meat on both sides in a non stick skillet coated with oil or bacon fat. Heat oven to 325. Line a loaf pan with foil long enough to extend over the side of the loaf pan. 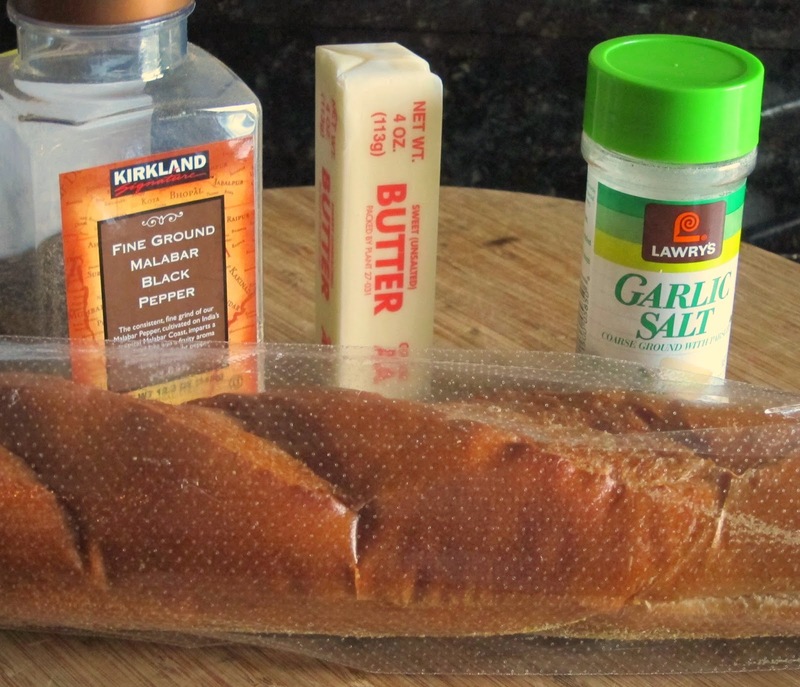 Mix all the ingredients together well and pack it into the loaf pan. Leave the foil hanging over the side, it will be used later. Bake the meat for 1 hour. Remove from the oven and drain off fat. Now use the foil to cover the meat and place some heavy cans on top to weight the meat down. Place it in the refrigerator overnight. When ready to serve, remove the meat from the pan and slice it thinly. Heat a large nonstick skillet over medium high heat and coat the bottom with oil (or bacon fat as I did). Put the gyro meat in the pan in a single layer and brown on both sides. It is now ready to serve. 2 cups plain Greek yogurt, I used full fat but it will taste good with fat free Greek yogurt. Peel the cucumber if waxed. Grate it on the large holes of a cheese grater. Place it in a colander and toss it with 1 teaspoon of salt. Let it sit for 10 minutes. Meanwhile combine remaining ingredients except salt and pepper. Add the olive oil and vinegar to taste. When the cucumber has sat for 10 minutes use your hands and really squeeze it to remove all the water. This way it will not water down your tzatziki. Once it is really well drained add it to the sauce. Then season with salt and pepper. Preheat oven to 200. Wrap the pita bread in foil and heat for 10 to 15 minutes to soften while preparing everything else. Once heated let everyone make their own gyro to taste with all the yummy ingredients. my leg of lamb. They really do need to chill so we did not have them until today. They were so good! We are truly being spoiled this week! Every time I opened the fridge I would sneak one! There are as many recipes for this dish as there are cooks but here is mine. 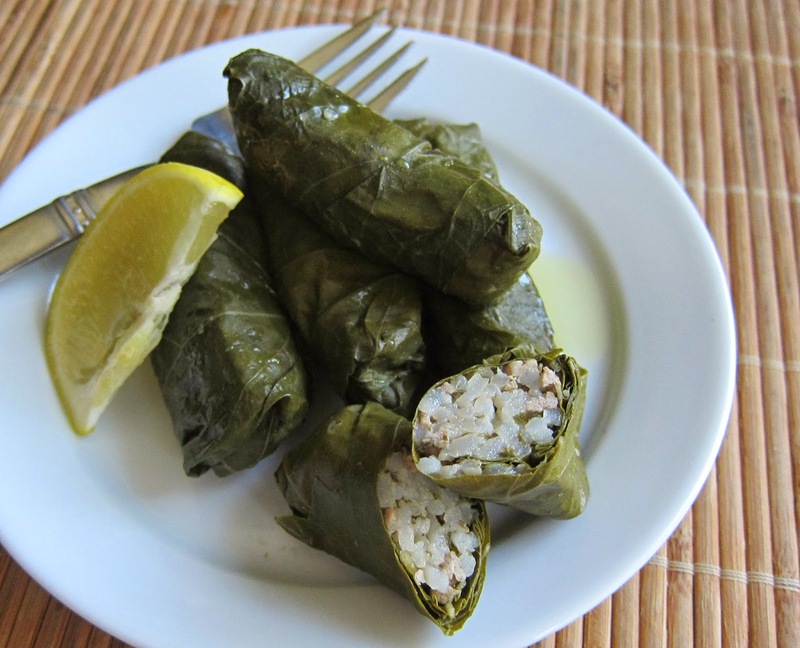 I like a lot of rice because I like the way it plumps up and fills out the grape leaves. By the way - I use jasmine rice for most everything because I just think it tastes better. The only exceptions would be sushi or paella. Simmer until water is absorbed. Use about 1 1/2 teaspoons for each grapevine leaf. Line a large skillet with the leftover leaves. Place the filled leaves in the skillet. Place an inverted plate over the leaves. Add water to just cover the stuffed leaves, bring to a simmer and cover and cook on low for 1 and 1/4 hours. Heat the olive oil in a large skillet. Saute the onion and scallions until the onion is translucent. Add the garlic and sauté for another minute. Add the lamb, rice, dill, parsley, pine nuts and lemon juice. Add 1 cup of water. Season well with salt and pepper. Take into account that these are going to expand some more so the seasoning will be diluted. Bring to a simmer and cook for about 5 minutes until the water is absorbed. The rice will not be cooked at this point. Let the rice mixture cool. Meanwhile remove the grapevine leaves to a colander and rinse well to remove the brine. Lay the leaves out on a board and clip off the tough stem. Fill each leaf with about 1 1/2 teaspoons of the rice mixture. Start rolling, then fold in the sides and continue rolling to make a cylinder. Take any leaves that remain and line the bottom of a large skillet with them. 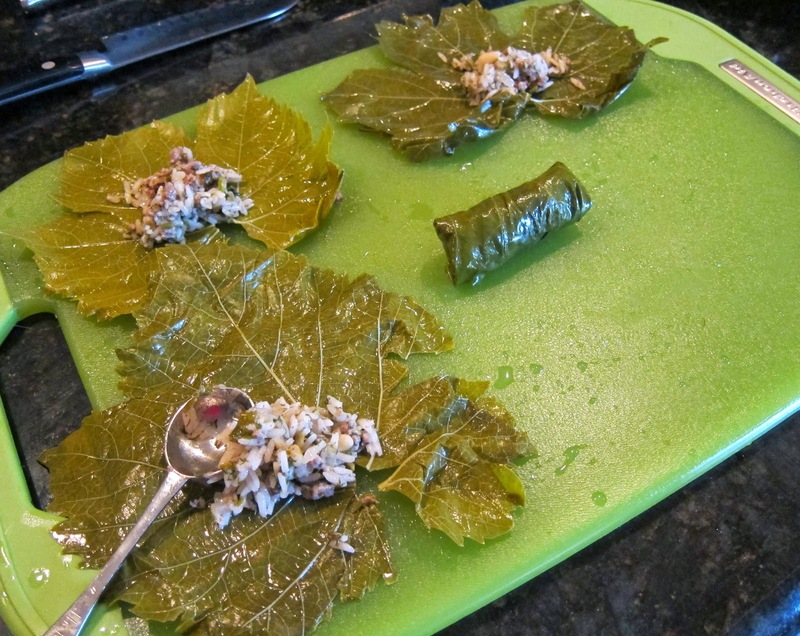 Arrange the stuffed grapevine leaves on top. Place an inverted plate over top. Add enough water to just cover the leaves (about 1 1/2 cups). Cover and bring to a boil. Reduce heat to low and simmer one hour and 15 minutes. You may need to add a little more water after 50 to 60 minutes to keep the bottom of the pan moist. Thoroughly chill the dolmades. When ready to serve place them on a plate. Drizzle with a good fruity olive oil and a squeeze of lemon juice. Right about the last week of the year, if you are very lucky, you will walk into Costco and the boneless leg of lamb will be on sale for $3.99 a pound. The sale only seems to last a day or two so you must hit it just right. Last year (December 2013) I caught it and bought one. Then of course thought why did I not get two and when I went back a day or so later they were back to regular price. This year I did buy two! And when I was back a few days ago - they were back to regular price. I put one in the freezer and tonight started on the other one. The leg of lamb was just shy of 4 1/2 pounds. I cut off a two pound portion that was kind of flat and butterflied. The other two pound portion was a big chunk. Tonight we had the butterflied portion as a roast for dinner. I ground the other portion and made Dolmades and Gyro meat. I will tell you about those tomorrow because we have not had them yet as both have to chill and there are no pictures of the finished dish. 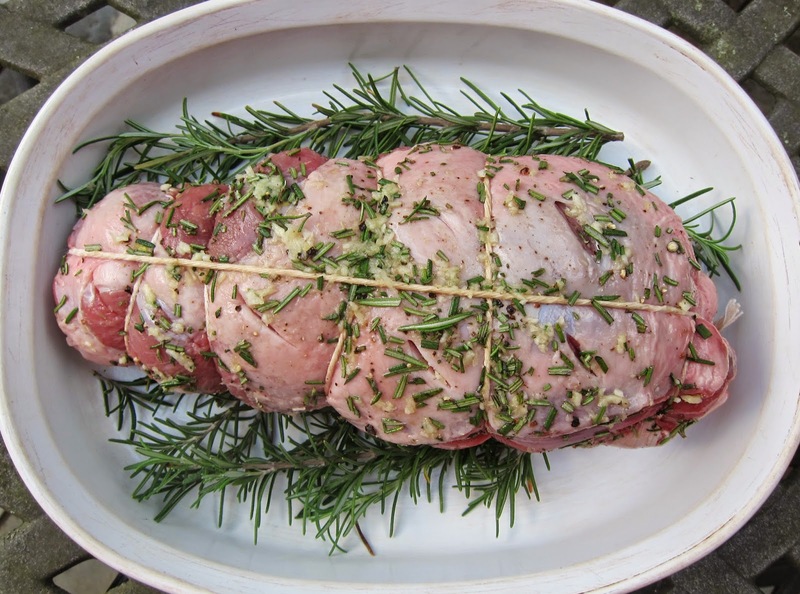 Season the inside of the lamb with salt, pepper, crushed garlic and a sprig of fresh rosemary. Tie the roast with kitchen twine. Place on a rack in a casserole or use fresh rosemary. Let the roast rest for 10 to 15 minutes, slice thinly and serve. Preheat the oven to 500. Open up the lamb and season the inside well with salt and pepper. Rub the inside with 1/2 the garlic. 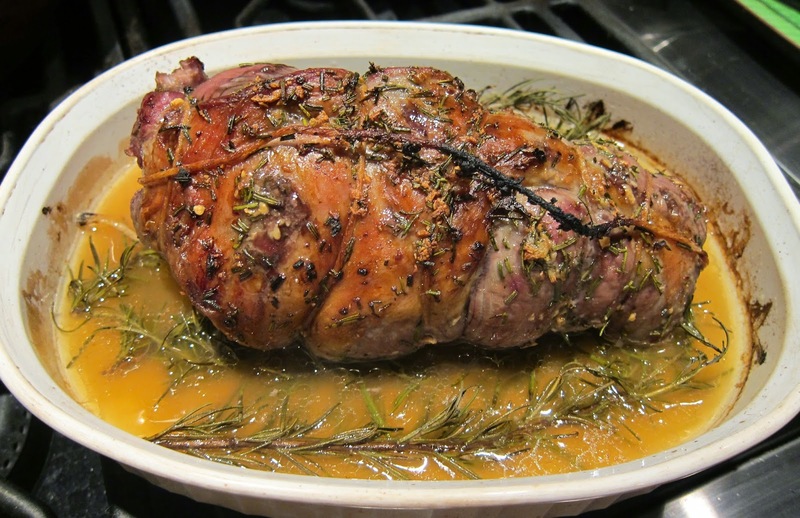 Place the sprig of rosemary inside and close up and tie the lamb into a roast. Make a couple of slits in the lamb to allow the seasoning to penetrate. Season the outside of the lamb with salt, pepper, the remaining garlic and the chopped rosemary. I used a bed of rosemary to set the roast on or you can use a rack. Pour the wine into the pan. Set the roast into the pan fat side up. Roast at 500 for 15 minutes then turn the oven down to 350 for another 20 minutes for rare, 30 minutes for medium. Remove from oven and let rest for 10-15 minutes. Slice thinly and serve. I really do not know where to start with this post. I have been mostly absent this last year as I have been through some major emotional events. My life will be forever different but that is life isn't it? Always changing. It is truly amazing how much we humans want to resist change yet it is so inevitable. I am so thankful to have my family and friends. They are the best anyone could ask for. So we continue. I have been in the kitchen. I just have not been posting. My New Year's Resolution is to blog more often. I have so much to share. I am starting with something simple here. I make these all the time. I know that many a New Year's Resolution is going to include weight loss and dieting. That must mean lots of salads. No doubt many will be low carb as that is the current trend. You need not load up on carbs but a few of these babies sprinkled on your salad will not harm you and will make it much easier to stick with the plan. They are light, airy and crunchy and fairly melt in your mouth. These are so good my family often does not wait for the salad but eats them out of hand straight from the container. They would make an awesome hostess gift, packed in a fancy container and bagged up with some salad tongs and a fancy dressing! This recipe calls for tossing the bread cubes in the pan with the cold butter. As the butter melts it coats the cubes more evenly than if you tossed the cubes into already melted butter in which case only a portion of them would get coated. These are so much better than those things you buy in the salad dressing aisle. They are so easy to make too. There really is no excuse not to. The reason this works is because each little cube of bread gets a light coating of butter before being baked to crisp perfection. Do plan ahead. 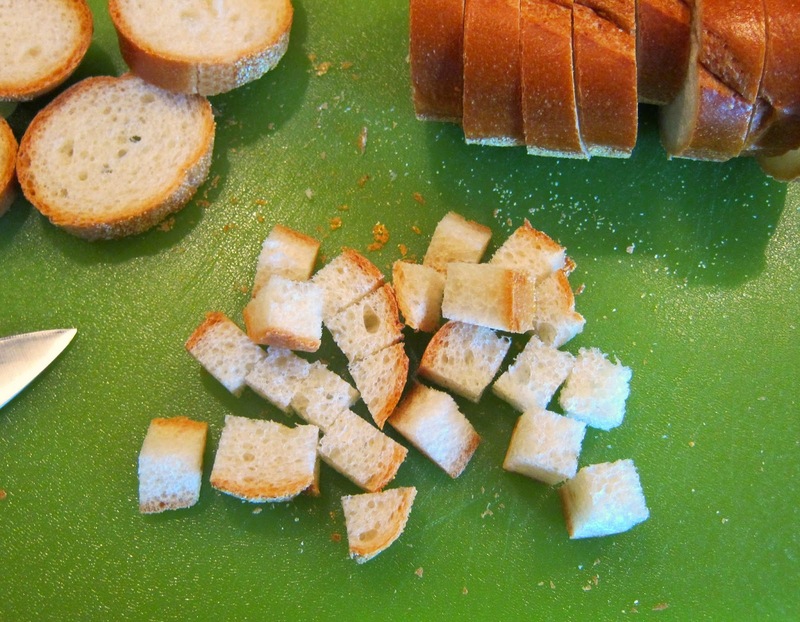 It is best to work with day old French bread because it is easier to slice without it squishing up under the knife. 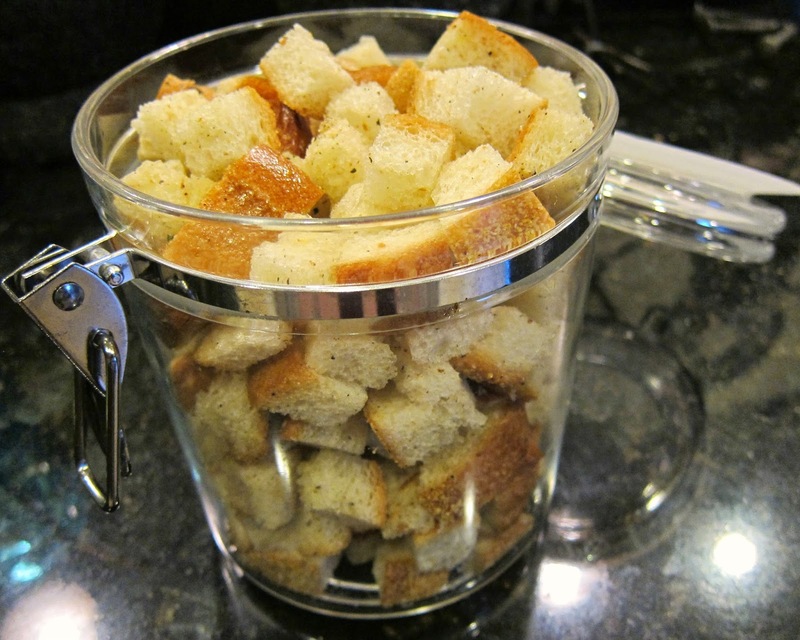 So here it is - The Best Homemade Croutons..
Cut day old bread into 1/2 inch cubes. Toss in a skillet over low heat with 2 chunks of butter so it slowly melts and coats each cube. 4 Tablespoons cold, unsalted butter cut into 4 pieces. Cut loaf in half and using 1/2 at a time cut loaf into 1/2 inch thick slices. Then cut each slice into 1/2 inch cubes. Transfer cubes to a large skillet. Sprinkle them with a scant 1/2 teaspoon garlic salt and 1/4 teaspoon black pepper. Add 2 tablespoons of cold butter to the skillet. Place the skillet over low heat and toss the bread constantly as the butter melts. What this does is make sure that each cube gets a hit of butter. Once the butter is completely melted toss the cubes for a few seconds more to absorb it all. Spread the cubes in a single layer on a baking sheet. Repeat with the other half of the loaf and spread on a separate baking sheet. 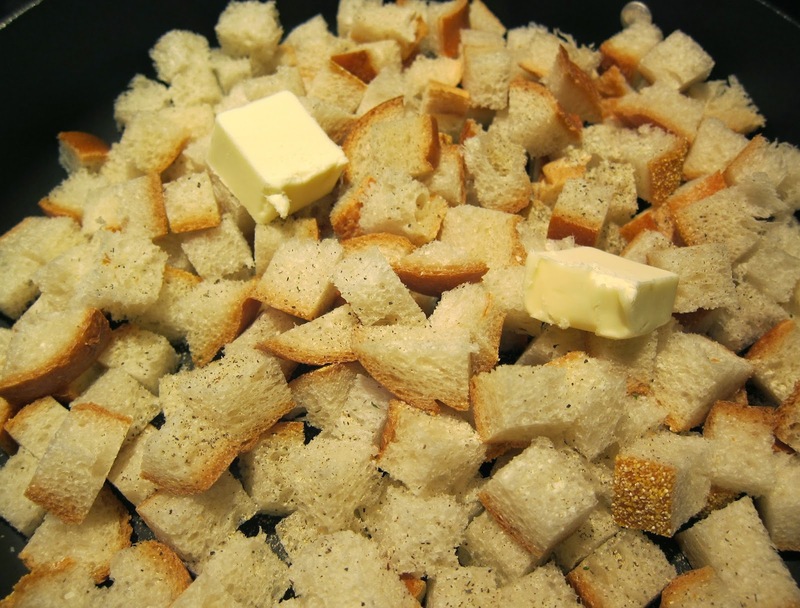 Place the croutons in the oven. Set the timer for 8 minutes. After 8 minutes use a spatula to toss the croutons around. Return them to the oven for another 8 minutes. Toss and turn them and then go 8 more minutes. They should be nice and perfectly crisp now. pack them in an airtight container.